Charles (also known as Charlie) was born 1881 in Freemantle, Southampton. His parents were Edmund and Elizabeth, nee Young. Edmund was born 1840 in Southampton and Elizabeth was born 1853 in Hythe, Hampshire. Charles’ 4 siblings were Ada b. 1878, Alice Mary b. 1883, Harry b. 1885 and Ethel May b. 1890. In the 1891 and 1901 census the family were living at 14 Upper Banister Street, All Saints, Southampton. Charles’ father Edmund was a Coachman/Groom, Charles a Postman and Harry worked as a Newspaper Printer. By 1911 the family had moved to 161 Above Bar Street, Southampton. Father Edmund showed he was a Retired Groom and now a State Pensioner. Charles was still a Postman and Harry is a Compositor. British Postal Service – Charles is mentioned in the June 1901 records as working in Southampton as a Postman. Charles married Charlotte Adelaide West 1913 in Southampton. Charlotte was born in Southampton in 1880. They had a daughter Dorothy A born 1915 also in Southampton. Charles / Charlie joined the Royal Defence Corps which was formerly (4670) Gloucestershire Regiment. His rank was Private, Service Number 47852. He enlisted in Cheltenham, Gloucestershire. 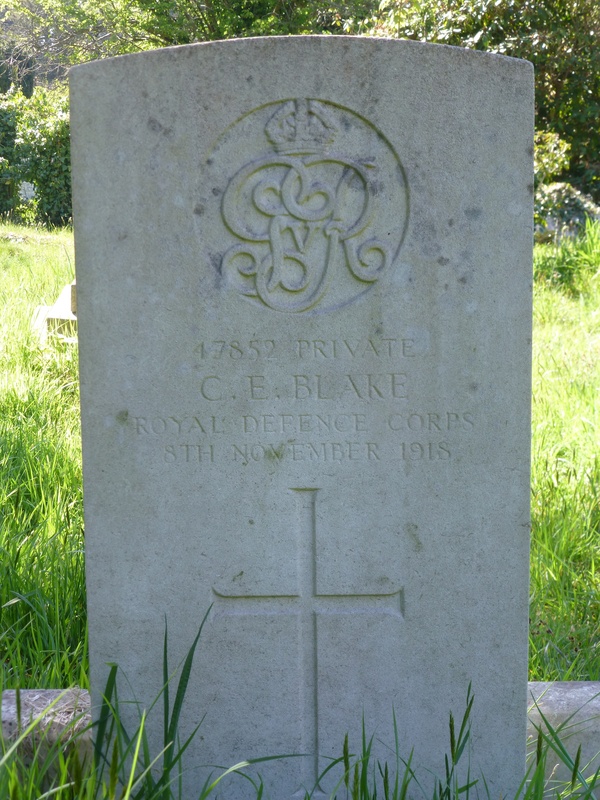 He died on 8th November 1918 aged 38 at home in the UK. He is Remembered with Honour at Southampton Old Cemetery. As Charles was working for the Post Office prior to enlisting he is also remembered on a Postal Memorial which can be seen at Southampton Mail Centre. Southampton Old Cemetery, on the Common, belongs to the Corporation. It was made in 1846 under an Act of Parliament and it now covers 27 acres. It contains 78 scattered British War Graves, a plot of 21 Belgians and one German.